The borough’s new street cleaning contract which costs over £4m a year for the next eight years will guarantee some of London’s cleanest streets, councillors have predicted. 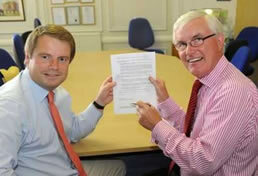 The contract has again been awarded to Fountains Group. This company has been keeping Wandsworth's streets "clean and tidy for the past six years". Last year Fountain's streets cleaners collected more than 9,500 tonnes of litter and flytipped waste - an increase of 790 tonnes on the previous year. This included a record tally of 171 tonnes of leaves removed from pavements last autumn. These were all composted and used in the borough's parks and open spaces. The Council inform us that despite this significant increase in the amount of litter collected, complaints from members of the public fell to their lowest level for more than a decade. The amount of waste and litter picked up from town centres fell by more than nine per cent - which is being attributed to better public education and enforcement programmes and the expansion of more efficient arrangements for the collection of commercial waste from shops. The new eight year contract will guarantee similar high standards of service and also deliver savings to Wandsworth's council tax payers of more than half a million pounds a year. Town centres like Tooting and Clapham Junction will receive six cleans every day while the others will be cleaned at least three times a day. There will be greater co-ordination between street sweeping teams and refuse collection crews with the street cleaners shadowing their colleagues closely to ensure that any spillages from binbags can be quickly removed. As well as a comprehensive litter collection and flytip removal service, the new contract calls for the rapid removal of leaves from pavements every autumn to ensure they do not become a slip hazard for members of the public. Dedicated teams of cleaners will now be employed on this task. Privately owned alleyways adjacent to public highways and footpaths, which are often prone to flytipping, will continue to be cleared to prevent them becoming an eyesore or a health hazard. The existing bridge and subway cleansing service, whereby walls and pavements in subways and underneath bridges receive regular intensive cleans to wash away pigeon mess and other detritus, will also continue. Mechanical sweepers will continue to be used to pick up litter and debris from footpaths. These can also be retro-fitted with snowploughs and grit dispensers and will be used to clear snow and ice from pavements during icy conditions. The contract will also include a clause that requires the removal of unsightly weeds and vegetation from footpaths and pavements. The changes to the current arrangements will deliver savings to Wandsworth council tax payers worth £511,000 each and every year of the eight year contract. This level of saving is in addition to a new £250,000 contingency fund that can be used to address emergency issues or unforeseen problems that may arise. The terms of the new contract have been drawn up following a detailed online survey of residents. A total of 499 people registered their views on a list of options and these opinions have been comprehensively reflected in the new arrangements. "We have worked extremely hard over the years to provide our residents, businesses and visitors with a clean environment and we are determined to maintain that record in the years ahead. We have drawn up a rigorous and demanding contract, which has been heavily influenced by the views of local people that will deliver clean streets and town centres for the next eight years. "This has been done with the twin aims of delivering a top quality street cleaning operation combined with the best possible value for money deal for our taxpayers. I am delighted to say we have succeeded on both counts."